Finding out more about how that biodiversity responds was a fundamental question behind the research leading to the publication of Medium-term dynamics of tree species composition in response to silvicultural intervention intensities in a tropical rain forest. The authors looked at silvicultural interventions – harvesting and thinning – and how tree species composition and diversity were affected over a 30-year period in the Brazilian Amazon. These were compared to pre-logging conditions and an unlogged control. 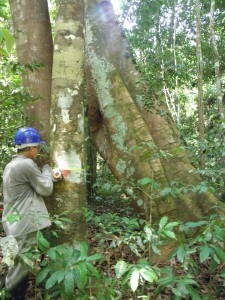 “We especially lacked information on the medium- and long-term post-logging responses of ecosystems to support the enhancement of practices toward sustainable forest management,” said Prof. Jürgen Bauhus, one of the paper’s authors, and the Chair of Silviculture in the Faculty of Environment and Natural Resources at the University of Freiburg, Germany. The researchers discovered that the strongest influence on tree species composition came not from harvesting the mature trees, but from the collateral damage done to remaining trees by harvesting and then by the subsequent thinning of smaller trees. “These unwanted impacts can obviously be reduced or avoided through reduced impact logging. That can be enforced by legislation or promoted through certification schemes,” she added. Referencing the 2015 Conference of Parties (COP) in Paris, he noted that there is a strong probability that conservative management practices that maintain high carbon stocks in tropical forests may be financially rewarded. This, he said, may help to increase the profitability of tropical silviculture and make it more attractive when compared to alternative land uses. He added that the research findings also supported Brazilian harvesting legislation, showing that the maximum harvesting intensities permitted by current Brazilian laws and regulations are unlikely to cause substantial changes in tree species composition in the long term.